Rainforests would be white if they reflected the visible colors of sunlight combined in equal proportions. They are green because the light they reflect has the purple colour removed. 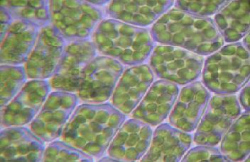 The purple is removed by chlorophyll molecules in the plants. These molecules absorb blue light and some red light. Red and blue light energy is used to fuel a chemical reaction between carbon dioxide and water. This chemical reaction produces glucose sugar, and a waste product, oxygen. During the day, the glucose sugar is used as an energy source for plant growth, and some is stored as starch. Starch is used at night to enable the plant to survive and grow. This process is known as photosynthesis, and is the source of our food chain.